- SAN FRANCISCO and BERLIN, April 17, 2019 /PRNewswire/ -- Adjust, the industry leader in mobile measurement and fraud prevention, today announced the launch of its new Unbotify product to end in-app bot fraud. Contrary to mobile ad fraud, in-app bot fraud does not target an app's marketing budget but attacks its business model after an install. Bots can be programmed to carry out various in-app events, and because they mimic human behavior, this type of fraud has become one of the hardest to detect and fight. "Bots can affect all apps in a number of ways, across every vertical. They can attack gaming apps' communities or ruin their virtual currency economy, steal credit card data or scalp limited edition items from e-commerce businesses, and spam users on dating apps," explained Paul H. Müller, Co-Founder & CTO at Adjust. "Unbotify's product adds another arrow to Adjust's quiver, and forms the foundation of our next-generation in-app fraud protection tools." 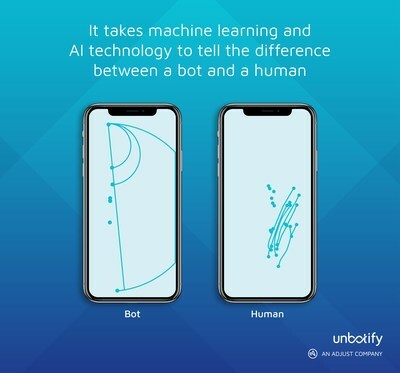 Unbotify is a bespoke, individually-tailored solution, which uses biometric sensor data to build machine learning models based on real users' behavior. By learning an app's natural user-flow, the solution can distinguish between humans and bots. The Unbotify solution will be available separately from Adjust's Fraud Prevention Suite, which stops ad fraud - performance-based fraud that directly steals ad money from an app's marketing budget. Because it is a standalone product, Unbotify can be implemented alongside Adjust's or other vendors' attribution service. "In-app bot fraud isn't just a monetary issue - it has knock-on effects on user experience, retention, in-app analytics, and breaches that compromise users' data and scar a brand's reputation," commented Yaron Oliker, Co-Founder and CEO at Unbotify. "Our behavioral-biometrics solution detects bots in real-time and offers the best possible insurance to protect the user experience." Unbotify's research estimates that some of today's biggest mobile apps lose around 10% of their revenue to bot fraud - and with the global app economy expected to surpass $120 billion by the end of 2019, bots seriously compromise apps' success. The launch follows Adjust's acquisition of Unbotify in January. The cybersecurity and AI startup was named by Fast Company as 'Israel's most innovative company in 2017' and listed as one of Gartner's '2018 Cool Vendors in Advertising'. Unbotify's bot-deterring solution is used by some of the biggest Fortune 500 companies in the e-commerce, social, search and gaming verticals across the U.S. and Europe. Unbotify's acquisition forms a bigger part of Adjust's commitment to fighting fraud on a global scale. The companies' shared mission is to provide the most robust solution to one of the major problems of application security today – stopping malicious bots. Adjust is the industry leader in mobile measurement and fraud prevention. The globally operating company provides high-quality analytics, measurement and fraud prevention solutions for mobile app marketers worldwide, enabling them to make smarter, faster marketing decisions. Adjust is a marketing partner with all major platforms, including Facebook, Google, Snap, Twitter, Line, and Tencent. In total, more than 25,000 apps have implemented Adjust's solutions to improve their performance. Founded in 2012, today Adjust has global offices in Berlin, New York, San Francisco, São Paulo, Paris, London, Moscow, Istanbul, Tel Aviv, Seoul, Shanghai, Beijing, Tokyo, Mumbai and Singapore. Adjust recently acquired data aggregation platform Acquired.io and award-winning cybersecurity and AI startup Unbotify. In February 2019, the company formed a strategic partnership with Adways, Japan's leading mobile marketing agency. These moves are part of Adjust's goal to unify advertisers' marketing efforts and build the best-in-class measurement and fraud prevention suite.